A couple of years ago, I attended a birthday party where the celebrant — wearing a soft pink gown richly beaded and layered with lace – was giddy on the dance floor. 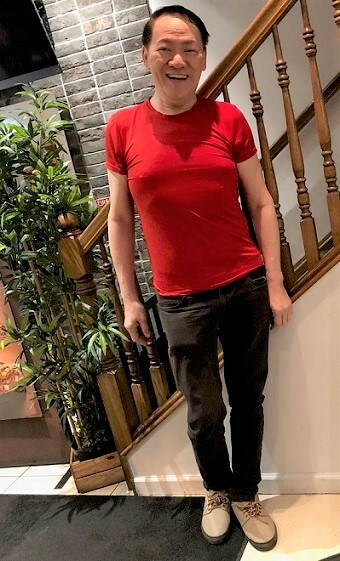 From that time on, I associated the designer Leonard Co, 59, with over-the-top embellishing and well-heeled clients who are usually nurses, doctors, business owners and executives. Leonard is in New York for his first-ever fashion show in Manhattan on November 3. It will be held at the Philippine Center with “women of distinction” as his fashion models, among them RN Evelyn Sison, accountant Lea Frain, Dr. Aida de Leon and Dr. Elma Castillo. 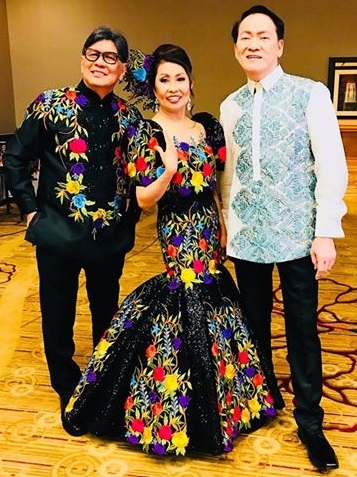 The organizer is the Garden State Filipino American Association, Inc. (GSFAA), led by Leonard’s friend and patron Francis Sison. Leonard and his long-time friends, Jersey City couple Francis and Evelyn Sison. Evelyn is his Muse and favorite model. Leonard described his style as “more and more.” More beads, more lace, more ruffles, more layers, more texture… That’s how, he said, his clients like their evening gowns or Filipiniana terno. 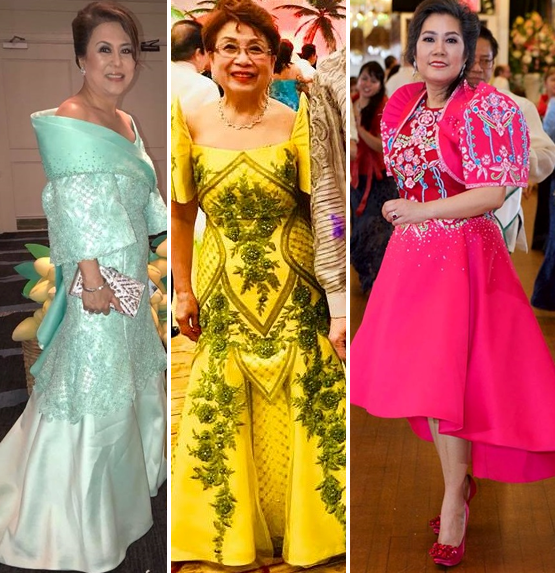 “Fully loaded.” These are the women so enamored with his designs they would buy not one gown but five or six at a time because they are busy community leaders who have parties to attend almost every night. The dresses are shipped, via DHL, from Leonard’s studio in Balete Drive, New Manila. The request is always the same: Frilly and flamboyant gowns, no less. “I already have their measurements,” he told The FilAm in an interview. Always, he travels with his assistant Mabel Rodriguez, who gets the measurements of new clients; she is also a cutter. Leonard has been with sketch pad since late 1980s and began designing for a living. He graduated with a Business Arts degree from Trinity College. His family is in the construction business. His mother was a seamstress – she owned a dress shop in Binondo in the 1970s — but that was not a factor behind his decision to be a designer. He is the youngest of three siblings, and his family is now based in Los Angeles. Among his contemporaries were Sidney Perez Sio and Randy Ortiz. The women of Leonard Co, from left: Dr. Elma Castillo, retired RN Cora Reyes, and nursing supervisor Joycelyn Aligarbes. He enjoys the annual travel to the U.S. to do benefit shows for friends, usually for Sison’s GSFAA. “I never demand any hotel accommodations when I come here,” he said. “I can sleep in friends’ homes.” From the East Coast he travels to L.A. to visit his family before heading back home. He met the Sisons in 1985 when he was introduced to Evelyn by her sister-in-law. Since then, he has been styling the neonatal ICU nurse, who is always dressed elegantly in Leonard’s eye-catching bodycons. In 2008, he had his first ramp show in the U.S.
“Many of my clients attend so many events, because they’re members of so many organizations or they’re always being crowned as beauty queens, Miss this, Miss that,” he said. That’s where the business is usually generated for designers like him. If a potential client is interested in a Leonard Co gown, the process entails a lot of back and forth emails. A deposit is required. It indicates that the individual is a serious client. He shared how one local personality asked him a lot of questions and ended up not placing an order. That, and collecting payment, can be the biggest challenges because he has encountered some deadbeat customers. So how much is a Leonard Co? He insisted it is nowhere near $3K! Leonard’s fashion show in New Jersey. 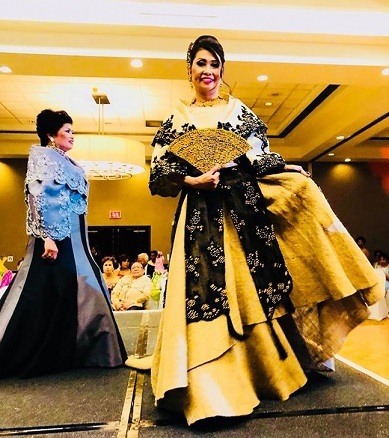 Evelyn Sison in a stylized Maria Clara with a filigree fan to complete the look.